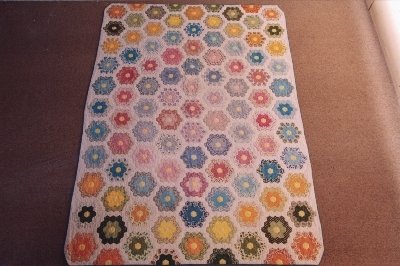 This hand pieced and hand quilted hexagon quilt is in a pattern often called 'Grandmother's Flower Garden'. The background is white and there are concentric rows of double rosettes each with a yellow centre. The colours start in the centre of the quilt with pink and then follow the rainbow. Paper templates were used. The padding is cotton (American) and the backing is cotton floral poplin. The quilt was made by Wendy Ritchie in 1966 in Melbourne for her daughter Susan Jane (now Shannon). Many of the cotton florals used were scraps left from dresses Wendy made for her daughters. Susan was born in 1961 and has always owned the quilt. It was on her bed from 1966 until 1978 when she left home and is not used now. "I (the maker of the quilt) embroidered from the first grade at school. Joined the Embroiderers Guild Vic in 1962. 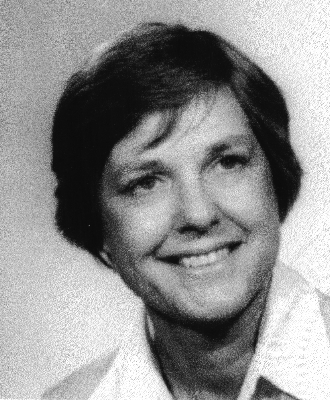 Served on the committee and was President from 1980-1983 inclusive. I have taught many techniques starting with English Patchwork in the late 1960s and including a variety of creative techniques in both design and painting/dyeing, machine embroidery and hand stitchery. 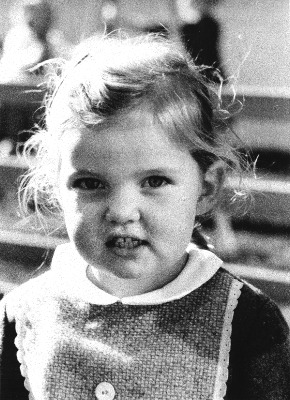 I was born in Geelong in 1933."